GALLERY46 is pround to present TOTEM graphic art project for Amnesty International, in association with Londonewcastle and Protein. Inspired by International Peace Day, a collective of makers, designers and artists have been invited to create their own one off sculptural graphic art pieces for a project called ‘Totem’ founded by They Made This. Curated and produced alongside Nicki Field, the project is in aid of Amnesty International and in association with Londonewcastle and Protein. As a teaser to the project a selection of the pieces launched at Protein’s Block Party, and exhibited alongside They Made This’ residency at Protein Studios last month. The full show will tour this autumn, first exhibiting at Amnesty International HQ in Shoreditch [until 11th December] and then moving to Londonewcastle’s Gallery 46 in Whitechapel on 14th December. An online raffle of the artworks will be drawn on December 20th, with all money raised going towards Amnesty International. Other noteworthy names in the line-up of 12 artworks include; Gemma Tickle (in association with East Photographic), Isabel & Helen, Damien Poulain, Rude, Emily Forgot, Marcus Walters, John Booth and Morag Myerscough. Aine Donovan, founder of They Made This comments: “We are incredibly honoured to be fundraising for Amnesty International on this project and so grateful to all the artists who have created these unique sculptural Totems. When curating projects, we are always looking for bright, colourful graphic artists who encapsulate the sense of hopefulness and positivity that charities like Amnesty International bring. 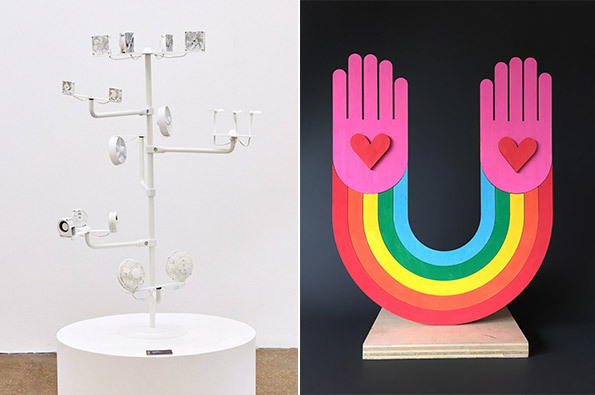 Artists like Morag Myerscough, Rude, Marcus Walters and Damien Poulain perfectly capture the same sense of positivity as Amnesty International do. They Made This is an award winning creative company founded by Aine Donovan. They represent the work of 40 artists selling Limited Edition prints online and through Pop Up shops. They also curate graphic art projects with clients including Amnesty International, BBH, Berwick St Market, Getty Gallery, Protein and Refuge. Their Soho Not Soso graphics arts project won a D&AD Pencil earlier this year and She Lights Up The Night graphic art auction has raised over £60k in support of Refuge in the last two years.. Their curated projects have included Camille Walala, Lakwena Maciver, Morag Myerscough, Anthony Burrill, Supermundane, Jean Jullien, Hattie Stewart, Mike Perry and Jon Burgeman amongst others. Protein and Protein Studios are based in the heart of Shoreditch. Protein Studios is an events, co-working, cafe and retail space. As an agency Protein helps businesses understand their audience through qualitative research and connects them through brand activations and authentic influence partnerships. Nicki Field is Head of Illustration at Jelly London and initiated the #TurnUp creative campaign earlier this year where illustrators and artists inspired 18-24 year olds to vote.